This is the kind of historical fiction I love. The author evokes a time and place, Paris of the late 1800’s. The world of the Paris Opera and dance came alive as I saw the ballerinas with their greasepaint practicing their pas de deux, plies, etc. Excerpts from newspaper articles regarding a real-life criminal trial taking place at the time gives an authentic “voice” to the story. Sometimes, Ms Buchanan made me “feel” that I was viewing a scene in “Les Miserables.” And who can resist the book cover? The story is told from two perspectives. 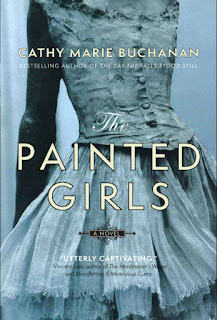 Antoinette, 17 and Marie, 13 are poverty-stricken girls whose father has died and whose mother is addicted to absinthe. They are desperate to find work or be evicted from their apartment. Marie applies to the Paris Opera to train as a ballerina, a “petit rat” – girls struggling to elevate their lives through ballet. Times are difficult and the girls are forever pawning household items in order to buy food. At one point they burn a drawer from a treasured sideboard in order to keep warm. Then, Marie accepts Edgar Degas’ invitation to paint her. He is obsessed with the ballet dancers of the Opera, and Marie becomes his muse for the painting ‘Little Dancer Aged Fourteen.’ She also poses for a would-be painter who wants nothing more than to see her undressed; readers need to be aware of some rather sordid sexual situations. So there is a dark underside to the beautiful paintings of tutus. But Marie is determined to rise from the gutter to the stage. Antoinette meanwhile accepts whatever work she can get, sometimes as a laundress, sometimes as an extra in a play. An opportunity arises and she gradually slips into the more profitable work of a “coquette” – euphemism for prostitute. The characters in the story are well developed as Marie and Antoinette face the moral challenges that are presented. The time period, as well as the world of ballet is well researched. The author successfully weaves fact and fiction into this beautiful, lyrical story, the themes of which are love, determination, and family loyalty. And it has a happy ending. I recommend this novel to readers who love Paris, ballet and Degas’ work. You won’t be disappointed. See some of Degas’ art at www.CathyMarieBuchanan.com/art.